A day spent exploring Naples, Long Beach (California) would not be complete without getting onto the water. One of my absolute favorite activities in this area is kayaking to the moon jellies in Long Beach. There is a jellyfish cove at the end of one of the canals where you can observe TONS of moon jellyfish floating around the water. Perfect as a solo activity, for couples old and young, for kids, and dog-friendly! There simply is no excuse not to check it out, especially when you know it’s moon jellyfish season in Long Beach! While Southern California generally has a plethora of outdoor seating areas so it’s not too difficult to find a good restaurant where you can dine with your dog, outdoor activities are a bit tougher. Rosie’s Dog Beach is an amazing space for your dog to run around but beyond that, what are other things to do in Long Beach with a dog? The answer – try kayaking! 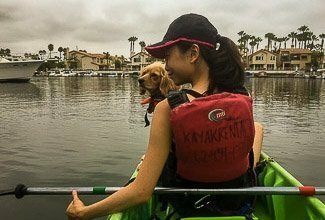 Kayak Rentals in Long Beach allows you to bring a dog aboard your kayak so you don’t have to leave your dog behind on your visit here. I LOVE doing outdoor activities with my dog, Clover, to burn off all her doggie-energy and see her smiling face. Excited and outfitted in her snazzy doggie lifejacket (always, safety over photogenic photos! ), we were ready to paddle out! But first, the company plays you a 2-minute, mildly entertaining, safety video. This is also your chance to ask any questions you may have about the route, the conditions, and any advice they have. They’ll provide you with a map (you can’t kayak in certain portions of the canals), kayak & paddles, life-jackets (bring your own doggie lifejacket), and a zip-lock bag in which to store your valuables. The below map is what Kayak Rentals will provide with your rental. If you accidentally lose your map, don’t get lost. Just bookmark this page to reference this map just in case! We paddled off the beach and were on our way. We passed two bridges and stopped to watch a very exciting motorboat race. It was exciting to see how fast they go and how excited and passionate the fans were! Take a right for a Jamba Juice or Starbucks break. Take a left for Spinnaker Bay, where the moon jellies supposedly floated around. We decided to go straight to the moon jellyfish since this was specifically what we came to see! Kayaking is a nice activity because you can paddle fast for a fantastic upper body workout, or you can paddle slowly and just enjoy the views. As we were paddling through, we were not seeing any moon jellies. Third-quarters of the way through, we were actually thinking of turning back because we were pretty tired. This, combined with the fact that I had read some Yelp reviews mentioning that sometimes you get unlucky. You simply don’t see any. Other claimed they were all killed. Yet more claimed they had all died off. However, we decided to just push through to the end. If not, just for our money’s worth of a good workout! It’s a good thing we pushed through and just decided to paddle to the very end because that’s exactly where they were. Literally at the very end. I guess that makes sense as moon jellyfish can’t really swim. They just float along with the water currents. There were hundreds of them, of all sizes, right near the surface of the water! I did not want to disturb or potentially injure them by picking them up, so I just dipped my hand in the water to just feel their body as they glided past me. They were such a strange texture, yet exactly how I would have imagined a jellyfish to feel. It’s hard to describe. It’s how I would imagine poking a raindrop cake would feel like (firm but squishy). In this FAQ section, I’ll be covering some common questions that people have about moon jellyfish. Since learning about their existence, I’ve been a jellyfish enthusiast of sorts. I literally tell everyone I know in the area to visit because it’s such an amazing experience. When is Moon Jellyfish Season in Long Beach? You have the highest chance of spotting moon jellies in Long Beach during the warmest parts of the year. Try to plan your trip between late July and early September. As the waters get warmer, there is less oxygen in the water, which is what jellyfish prefer. As the effects of global warming are magnifying, you may have heard about an influx of jellyfish sightings at beaches around the world that don’t normally see jellyfish. This is concerning. How large are the moon jellyfish? Moon jellyfish range between the size of a mug coaster to the size of a frisbee. Where have I seen moon jellies before? Moon jellies are often picked up by aquariums for touch exhibits as they rarely sting. If/when they do sting, their mild venom is not fatal to humans. If you practice sustainable tourism and prefer to avoid zoos and aquariums, this is a great opportunity to observe moon jellyfish in a more natural environment. Moon jellies eat zooplankton. However, when this is scarce, they can shrink their bodies by 90% to conserve energy and redevelop to their normal size when food is more readily available. Turtles love moon jellies. This is a large reason why plastic bags are so dangerous and we should say no to them in grocery stores (and in life). Plastic bags floating in water closely resembles these jellies, causing turtles to try to eat them for nutrition. Beyond turtles, fish and birds also feast on these jellyfish. Whether you’re a tourist or playing tourist in your own city, I highly recommend kayaking to see moon jellies in Long Beach. If you’re looking for a fun way to keep active for a few hours, make a trip out to the Naples Canals in Long Beach. Paddle out to Spinnaker Bay and dip your hand in the water to (gently) feel the unique texture of a moon jellyfish gliding past your outstretched fingers. You’ll have a blast!